On March 24, 1913 the Palace Theatre opened its doors to the public. The theatre was funded by Martin Beck, a vaudeville entrepreneur from San Francisco and president of the Palace Realty and Amusement Company. Beck ran the Orpheum Theatre circuit, the dominant vaudeville chain in the West. He hoped to break into the vaudeville scene in Manhattan, challenging the dominance of the B.F Keith and E.F. Albee-controlled United Booking Office. Despite Beck’s intentions, Albee quickly acquired the majority interest in the theatre through a series of investments. Vaudeville went out of fashion in the 1930s, and the Palace suffered declining audiences. In 1932 the theatre began showing movies as well as vaudeville performances, and from 1935 to 1949 it exclusively screened movies. In 1951 Judy Garland premiered a twice-a-day vaudeville act at the Palace, which lasted 19 weeks and revitalized the theatre for live performances. 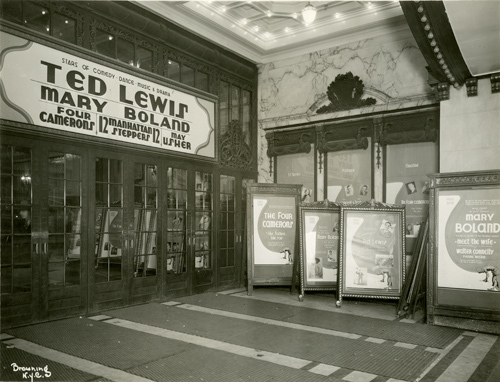 Over the next 15 years the theatre switched back in forth between film and performance, until it was purchased in 1966 by the Nederlander family and reopened as a live theater. The Palace is still in operation today.